You Only Live Twice...at least, that's the title of the James Bond movie filmed in Japan. What if that's true? What if you only live twice-or even just once? Well, then you shouldn't waste your time dealing with the hassles of planning your vacation. Instead, let Monograms handle the details and logistics, so your time is spent planning what to pack, bragging to your friends about your vacation, and enjoying yourself! 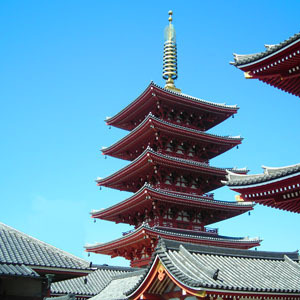 On this 7-day vacation, we've arranged hotel accommodations for three nights each in Tokyo and Kyoto, as well as private guided sightseeing in each city, breakfast daily, and a bullet train ride from Tokyo to Kyoto. Plus, in each city, an expert Local Host® is on hand and at your service to ensure your trip runs smoothly, to answer your questions, and to help you put your own personal stamp on your vacation. Upon arrival, check into your hotel and say, "Konnichiwa" to your Local Host, who will greet you and provide valuable tools to help introduce you to Tokyo. A "prefecture" and capital of Japan, this is the world's most populous metro area and home to unlimited choices-shopping, dining, entertainment, historic temples and sites, peaceful gardens, and excellent museums. After a restful night, rise and shine over a hearty breakfast. Afterward, embark on a private guided sightseeing tour using Tokyo's famous subway system. You will see the Meiji Shrine, a 20th-century Shinto monument built within a man-made forest; the Samurai Museum, where you can learn about Japanese history and see authentic swords and armor; stop at Shinjuku Gyoen Garden, dating back to the 1600s; visit the bustling Nakamise Shopping Arcade; and one of the city's most colorful temples, the Asakusa Kannon Temple. Enjoy the evening and the following day at your leisure. Your Local Host will have suggestions about what to see and do during your stay. Perhaps take an excursion out of the city to Mount Fuji, a UNESCO World Heritage Site and one of the country's most iconic landmarks. Here, you will cruise on Lake Ashi and take a cable-car ride for spectacular views of the Owakudani volcanic valley and majestic Mount Fuji. Or maybe do a bit of exploring on your own. For an unforgettable view, ascend the 2,080-foot-tall Tokyo Skytree tower and if you're a tech enthusiast, spend some time in the Akihabara electronics district. 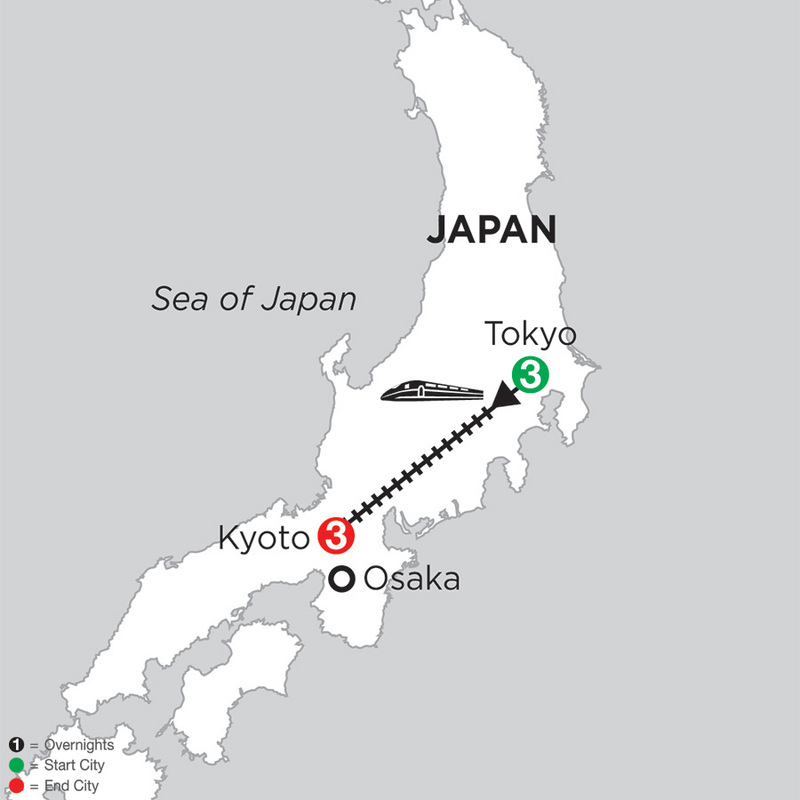 A highlight of the vacation is the Shinkansen (bullet train) ride from Tokyo to Kyoto. Between the nearly 200-mile-per-hour speeds and niceties like heated toilet seats, this is, by far, the most entertaining way to travel between cities. The "cradle" of Japan's cultural heritage, Kyoto, the "City of Ten-Thousand Shrines," was the country's capital and residence of the emperor from the 8th until the 19th centuries. Monograms take you on a guided sightseeing tour that includes visits to Sanjusangendo Temple and the beautiful Temple of the Gold Pavilion. Built on a lake and surrounded by a thick forest, the image of the temple's reflection in the water is a must-take photo. You'll also walk through Gion and explore the thousands of Torii Gates at Fushimi Inari Shrine. In your free time, hop aboard a rickshaw for a ride through the Old Town, visit nearby Nara, join a Japanese cooking class, attend a sake tasting, or indulge in some of the country's finest Japanese cuisine. Between the transportation we've arranged, sightseeing we've included, and the hotels we've booked, the only thing left for you to do is pack your bags and enjoy! With all the time and hassles saved and the comfort of knowing you'll have a Local Host to help you during your vacation, you've got one fantastic vacation!